It is said that for an HR, there is no magic bullet to hire the right talent. When you are not a computer programmer yourself, things become more difficult as there are a lot of technical requirements you need to look for. While interviewing, candidates can say a lot of things about programming which they might not even know. Being a non-technical recruiter, it’s very difficult to verify their claims. As there are many such issues, let’s just start with the step by step guide of how we can hire the right fit computer programmer for your organization. Always start with a resume but wait for a second, if your computer programmer doesn’t have good learning ability, coding skills, critical & analytical thinking skills or proper communication skills, do you think your candidate can survive in an organization or even like by other employees? Why waste time in going through all the pain to judge a person from a resume when you are hiring a computer programmer, not a creative designer. Resumes of any computer programmer may not show you the real face of candidates. In this case, computer programmer aptitude test is what you will need. It will screen all those candidates who don’t have a basic understanding, and you will be spending time with only qualified candidates. The process of hiring programmer who is job-fit becomes easier and faster when you evaluate the candidates at an initial level. One of the questions asked by hr is should we hire the computer programmer on basis of experience?? If one of your candidates doesn’t have any relevant experience and other one does, it may be possible that the experienced candidate may not have a deep knowledge of coding then what will you do?? One of the best ways is to choose a platform which evaluates computer programmer skills with application-oriented question sets that can help you to analyze the expertise of candidates in computer programming, their analytical and problem-solving skills too. 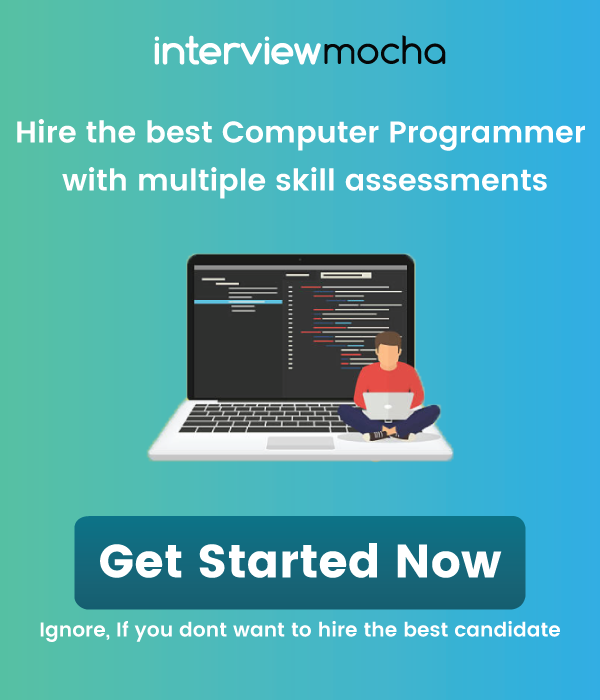 Interview mocha-online assessment software provides an enterprise-ready platform where you can assess multiple skills of candidates. Interview mocha has 1000+ skills assessment tests which can be customized according to job role with webcam proctoring features so that candidates can give test from anywhere without the need for supervision. Our intelligent reports then can help you to easily evaluate any candidate. Check your candidates resume if they have anything that stands out - It may be their creative way of presenting things or experience or certificates or programming languages. You may ask why?? Because they have put an extra effort to get this job and chances are they will put the same extra effort for the job as well. Usually, computer programmers don’t really think a lot in creating a good resume and that’s why evaluating them on aptitude & job role-based skills assessment tests is so important. You can combine them to form a single test to evaluate your candidate on Specific skills. Your hiring manager will help you out in this as you don’t possess the programming skills. Yes, you can take information from an expert and take interview all alone but an expert is always better and recommended. Talk on any technical subject for at least 10 minutes. What hours do you prefer working? During what times are you most efficient? How can you fix these certain issues? What steps will you take to finish a certain project on time? A great employee doesn’t necessary means he will fit in your culture, always ask about their future plans, hobbies, and interests. As culture varies in an organization in terms of values, job roles, rules and regulations so act accordingly. As we know, together everyone can achieve more. The candidate should be a team player who can efficiently work with a team member to achieve common goals within time. Audition mini project - At last, never ever hire a person without giving a project as this will definitely help out to know if that guy is actually capable of applying his knowledge to perform given tasks to get desired output. If you have 2 or more candidates and you are still not able to figure out whom to choose, then this is the best way to know who will actually be a performer. Go for a Drug Test - If everything goes right and you have selected your candidate, make sure you check candidate for a drug test for ensuring the candidate will maintain his productivity and won’t create the nuisance. Period - Assessing Computer Programmer skills have never been this easy. 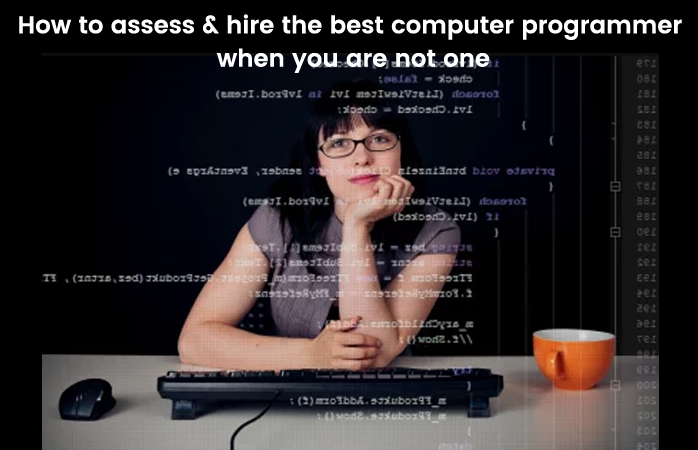 You may or you may not hire the Best Computer Programmer but this will definitely help you out. You Will Know Exactly Which Candidate to Hire as A Computer Programmer Who Will Fit the Job. Helping Greenhouse users to assess candidates with 1000+ skill tests. Devoted my time to understand- Interview Mocha + Greenhouse and the blend of two, which can be the factor for any company’s success. What skills should you look for while hiring an Excel Expert?